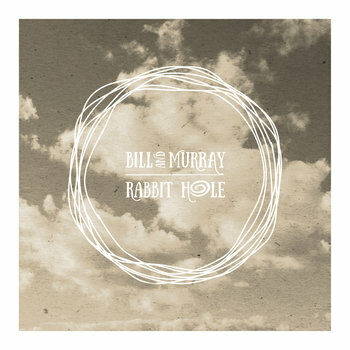 Bill & Murray: Rabbit Hole E.P. Based in Tel-Aviv, Bill & Murray is a trio formed in 2013 by David Blau (guitar, vocals), Stella Gotshtein (keyboard, vocals) and Ran Jacobovitz (drums). In two years they already have on their back participations at international music festivals in North America and Europe, an East European tour and they opened for Gary Numan. "Rabbit Hole" is their first single from their forthcoming album 'A New Kind of High' that will be released this fall, as far as I understood. On this three tracks single the band is only formed by Stella and David and present a minimal approach to new wave and pop. The main song is a melancholic yet energetic tune that sometimes recall me Slowdive mixed with Kylie Minogue because of the dreamy and catchy approach. "What's There To Fear (live)" is a bit less pop but still dreamy and sees the band playing a minimal set with tribal drums, a basic synth line and a guitar. "Rabbit Hole (Sketch)" closes the single with a demo version of the main track which now sounds more intimate and minimal thanks to the use of two bass lines and male / female choruses. The single is downloadable for free here https://othervoicesrecords.bandcamp.com/album/rabbit-hole-ep and the package includes a nice video for "Rabbit Hole". The third release from Melbourne-based label Plasma Audio, which seems to focus on quality rather than quantity, got signed by brilliant Dutch dj and producer Bertran Van Den Hoff aka Fre4knc - he already signed many good tunes and breaks on renowned labels like Dispatch, Samurai and Noisia's imprint Invisible as well as a plenty of great parties in Groeningen and followed broadcast on jungletrain.net -. He shoot two banging tracks, whose style is in between the above-mentioned Noisia, Black Sun Empire and the darkest stuff from producers like Loxy and Icicle. The first seconds of "Chain of Command" could let you think the track will move towards atmospheric drum'n'bass before the pattern begins to roar like a cyber lion by means of roasting pinwheels of hi-hats and kick drums, electronic spit-up and fast stacks of churning stop'n'gos. Fre4knc's artillery fires got increasingly dark and curt on the following track "Sinjek", but it's likewise punchy in spite of a shabbiest list of recipes. London-based producer Chris Royle, mostly known for his moniker Dexta and as one of the most active heads behind well-known label Diffrent Music, the label of the pink giraffe which became one of the most interesting in the overcrowded bass-driven music scene, recently landed on None60, the imprint by the excellent d'n'b duo Silent Dust, by means of a couple of good tracks, which swirl on the boundaries between electronic dub and drum'n'bass. Both the title and the heavily echoed vocal sample of "Tempest Dub" are the same of the track by which the brilliant Brighton-based duo SpectraSoul made their debut, but the sound of Dexta is quite diff(e)rent as youc an imagine if you followed some of his recent releases on his own imprint as distorted low-frequencies and puffy synths makes the dub stepping really viscous and catchy, while the speed significantly increases on the balanced dosage of hitting claps, blunt beats and bass worms of the following "Mukky Riddim". The aesthaetics of Yann Novak, mainly based on the transformation of field recordings into immersive ambient drones, got applied to a series of sonic stuff that young Italian sound artist Fabio Perletta grabbed at Pere Lachaise cemetery, Paris on April 19th, 2013 for this entrancing 45-minutes lasting suite. Its title refers to the anthropological concept of liminality, the transitional moment when someone taking part to a ritual experiences the "rendering" of the cathartic effect, the in-between state of mind before the ritual itself and its ultimate achievement, when the connections between thoughts and beliefs of a pre-existing "order" disappear little by little. The breeze - you won't easily understand if it was an environmental element or the final result of the dilation during sound processing -, which blows over the sonic clues of the liminal place like a cemetery could be in fact, is a constant presence of this process and its circular convolution of delays, echoes and gentle saturations sounds like an amorphous soup where sonic connections to reality denatures till the moment when that wind turns into a sort of breathe and the first atomic collisions in the middle of the track begin to dig into the bowels of consciousness. They demonstrate that amorphousness doesn't have to be bereft of true substance. Made under commission of Oslo-based mini festival Tape To Zero with the support by Arts Council Norway, this release pools the sonic exploration by two Norwegian kings of ambient music. Geir Jenssen, better known as Biosphere (the most recent trace on our zine has been left by his self-signed release "Stromboli", an awesome release that he made from a series of field recordings taken nearby the hot edges of the notorious Sicilian active volcano), is a pioneering veteran of 90ies crosses between ambient music, electronica and proto-house, whose distinguishable aesthetics that spurted out of references to arctic landscapes and Russian space crafts reached out to many contemporary music lovers. He doesn't really need introduction, as a matter of fact, while Deathprod, the musical id by Norwegian producer Helge Sten, is maybe less known, even if he's the man behind the curtains of many releases on Rune Grammofon and already co-signed a tribute album to Arne Nordheim (1999), the Norwegian composer whose music was so intimately related to space exploration that astroners named the asteroid belt between Mars and Jupiter in his honor. The first inocoluted three awesome tracks, where he ignites this sonic journey by pensive micro-ambient sequences of light propulsions and suspensions, borrows the name of the unit for symbol or modulation rate in telecommunication, the baud, for the amazing extra-vehicular transmission "Baud" and forged a breathtaking track - "Space Is Fizzy" - in the aisle between synth-driven cosmic ambient and some cliff-hangers of his own "Microgravity". The latter came in on the dimming elongated grandeur of "Shimmer Flicker", liquefies silent particles on "Polychromatic", blows over pulverized symphonies on the beautiful "Disc" and seems to drive an empty vessel between astral bodies on the final "Optical".